As we’ve mentioned in our article of Awa-Odori, the yosakoi dance is a modern version of tradition Awa-Odori Summer Festival and it was originated from Kochi Prefecture located in Shikoku, Japan. 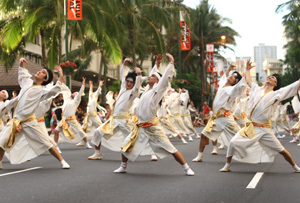 Ever since then, the yosakoi dance was accepted from young people in Japan as well which has been tremendously popular. Also, there are schools and teams of yosakoi dance throughout Japan. 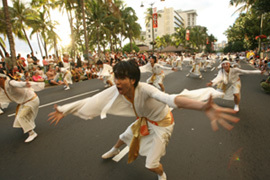 The dance is performed at various places such as festivals and school events. In addition there are competitions where the dancers show their dancing skills. The yosakoi dance is creative and also energetic which is a fusion between traditional dance and contemporary music with a modern form. The word “yosakoi” is a dialect of Tosa Province (old province of Japan in the area of Kochi Prefecture) which means “Night come early” in the modern local dialect. Furthermore, both young and old want to dance in the yosakoi dancing team is because they like to stay being creative and energetic. Also, there are various types of wild costumes depending on the theme of each team. The instrument called “naruko” is normally used for the yosakoi dance which is made out of small wood similarly to castanets. Originally, it was used for driving away birds by the farmers in Kochi Prefecture. In addition, there are teams that use taiko drums, big flags and baton in their dance. The most famous yosakoi festival is been held in the city of Kochi during August, where there are over 10,000 dancers participating in the event. Also, the yosakoi festivals are spreading in various places such as Harajuku (Tokyo, Japan), Sapporo (Hokkaido, Japan), Nagasaki (Kyushu, Japan) and Surabaya (Indonesia). The Honolulu Festival Foundation is very pleased to have Sugaizanairen, the exciting yosakoi dancing team from Kochi Prefecture for the 14th consecutive time. For 25 years, Ms. Kunitomo Suga, the founder of Sugaizanairen has been active in promoting love and world peace through her dance which includes forms of traditional yosakoi, aerobics, jazz and hip-hop. Her project is called “Yosakoi Nippon” in which she has branched out her activities to Honolulu, Maui, Seoul and New York. Please do not miss this exciting and memorable performance!